Dom Jean Prou, Abbot of the French Benedictine Abbey of Solesmes from 1959-1992, was a leading churchman of his time. Pope John XXIII, who had made several retreats at Solesmes during his tenure as papal nuncio in Paris, nominated Dom Prou to the Commission for the Liturgy at the Second Vatican Council. The letters from the Abbot of Solesmes quoted below speak of the artist's drawings on the dance at the Paris Opéra as a complement to his work on the monastic life. 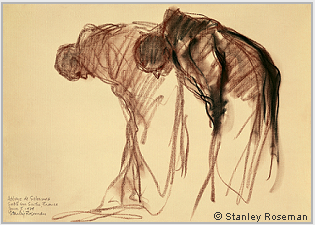 Two Monks Bowing in Prayer, 1979, is conserved in the National Gallery of Art, Washington, D.C., (fig. 1). Roseman drew this spiritual work of art at the Divine Office at the Abbey of Solesmes, renowned for the study and restoration of Gregorian chant, a reverential musical expression associated with singing the Psalms. Roseman was invited in 1989 to draw the dance at the illustrious Paris Opéra. The prestigious invitation from the administration of the Paris Opéra was greatly meaningful as the Dance holds a preeminent place in the cultural tradition in France and is an important subject in French art. The Bibliothèque Nationale de France in a biographical essay on Roseman for the publication of its exhibition Stanley Roseman - Dessins sur la Danse à l'Opéra de Paris, 1996, praises the artist's "magnificent drawings'' and states "Stanley Roseman's drawings show the many facets of his great talents as a draughtsman.'' An " 'honorary member' of the ballet troupe,'' Roseman drew at rehearsals in the dance studios and at the pré-générale and répétition générale (dress and final dress rehearsals) in the auditorium, and he was given the extraordinary privilege to draw from the wings of the stage during performances at the Paris Opéra. ''I have just returned from a sojourn in Martinique, where are two monasteries of our Congregation on that island in the Antilles. And I found the magnificent book of your drawings on the dance at the Paris Opéra. "The book is a very beautiful gift, for which I thank you personally, but also in the name of our present Father Abbot and all of our community. "What strikes me the most about your drawings is that the ''movement'' of the dancers is, as it were, rendered in a living way. 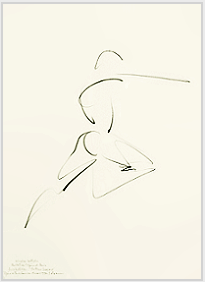 One believes, in looking at your drawings, that one is present at a live performance of the dancers whom you have drawn at the very moment they leap or take a position. "Dancers of the Opéra and monks are people who are very different and who, certainly, lead a very different life-style, but that does not prevent you from being interested in a very serious and very steadfast way in those two kinds of artistic expressions and life-styles, for each group - the dancers and the monks - cultivate with care, and, I think, put all their heart into the art that is theirs. For one, it is a visual art that strives towards a beautiful, human fulfillment and contributes toward heightening the spirit; for the other, a spiritual art that strives towards a greater union with God and to obtain the graces for our world. The two disciplines demand much effort and perseverance. Your artist's soul has made you interested in both dancers and monks and strives to express them in the most profound way. "I ask God that the rapport you have with the monastic life grant you His favors for the well-being of your soul, and the same for Ronald, who always shows us, like you, much kindness. My prayers for you both are the only way that I can show you my friendship and my gratitude. From Roseman's oeuvre on the dance at the Paris Opéra are presented above Elisabeth Platel, 1996, (fig. 2), and Nicolas Le Riche, 1996, (fig. 3). The Musée d'Art Moderne et Contemporain, Strasbourg, acquired four of the artist's drawings on the dance - "drawings of great quality,'' write the Curators Rodolphe Rapetti and Anny-Claire Haus in their cordial letter of acquisition. The museum's acquisition includes the splendid drawing of Paris Opéra star dancer Elizabeth Platel. Roseman's swiftly flowing pencil lines depict the virtuosa ballerina in a breathtaking leap in her variation from Balanchine's jubilant Tchaikovsky-Pas de Deux. 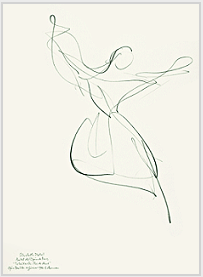 See also the website page "Biography," Page 6 - "Drawings on the Dance at the Paris Opéra." Roseman's ecumenical work on the monastic life encompasses communities of Anglican and Lutheran monks and nuns as well as Roman Catholic monastic communities, which account for the greater number of monasteries in the Western Church. Benedictine monasticism in the Church of England dates from the nineteenth century with the emergence of several religious communities that adopted the Rule of St. Benedictine as the basis of a life of prayer and work. In 1914 a community of Anglican Benedictine monks was established in Pershore, Worcestershire. Some twelve years later, the monks resettled on the former estate of Nashdom, in Buckinghamshire, and, in 1987, they made a subsequent move to a new location, Elmore Abbey in Berkshire. At Nashdom Abbey in 1983, Roseman and Davis met Dom Francis, the subject of the portrait presented below, (fig. 5). Returning to England the following year, the artist and his colleague sojourned again with the Anglican monks at Nashdom. Dom Francis had been recently appointed Prior, an appointment that the annual Nashdom Abbey Record, 1984, notes was "a decision which gave much pleasure outside the community as well as within it.'' Dom Francis' responsibilities in the Abbey were diverse and included those of infirmarian and organist as well as the arranging of receptions for special events, such as interfaith dialogues. 4. 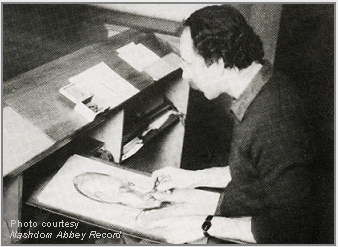 Stanley Roseman drawing in the choir of Nashdom Abbey, England, 1983. Photo courtesy Nashdom Abbey Record, Advent 1983. Caption reads: "Stanley Roseman at Work." "It must be a joy to live in Paris, especially at this time of year as the autumn comes. I love climbing those stairs up to the Sacre Coeur. It is my favourite place in Paris. I love that grand wedding cake edifice and there is a wonderful sense of peace and prayer as you enter the church with the Blessed Sacrament enthroned on the High Altar. I love the Notre Dame too of course with its sense of mystery. The Opera House is very grand. Roseman and Davis' friendship with Dom Francis continued over the years through letters and cards, such as when the monk received a gift from the artist of the Bibliothèque Nationale de France publication for the exhibition Stanley Roseman - Dessins sur la Danse à l'Opéra de Paris. "I am glad that your work is going so well. It must have been so exciting to go to the Paris Opera. . . ."
Dom Francis, who is fond of cats and for years has provided meals for stray cats who come to the monastery kitchen door or window, cheerfully remarks to the artist: "That is lovely that you have got a cat." "Thank you so much for your letter and your beautiful drawings of the Ballet so full of life and movement. The Benedictine monk sends greetings to Ronald and closes his letter: "God bless. Love and prayers, Francis." In March 1999, leaving his feline companion in Davis' care in Paris, (as cats then could not enter England without a long period of quarantine), Roseman made a trip to Elmore Abbey. The monks were warmly welcoming and Dom Francis expressed his great pleasure in seeing Roseman again after some fifteen years. The artist created a suite of excellent drawings of the monks, which includes Dom Francis, Portrait of a Benedictine Monk in Prayer, seen above, (fig. 5). Aftonbladet, Stockholm, in a Sunday magazine cover story on Roseman, commends him for creating portraits "artistically on a high level as well as accurately expressive of the human dimension.'' The portrait of Dom Francis depicts the monk in profile, his head lowered in prayer. There is a great sense of detail in the drawing rendered with minimal use of line and tone. Descriptive contours in bistre and black chalks are complemented by the passage of bistre chalk depicting the fringe of hair somewhat reminiscent of a monastic tonsure of former times. Reserved areas of the gray paper enhance the Benedictine monk's fair complexion; subtle shading in bistre chalk adds warmth to the shadows. Highlights in white chalk illuminate the cranium and face of Dom Francis. 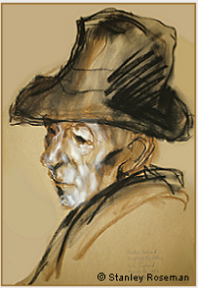 Roseman has expressed in this beautiful portrait the man's dedication to the contemplative life. During the 1980's, Roseman was writing a text to accompany his paintings and drawings on the monastic life and did much research on the subject of monasticism. The artist was greatly encouraged by monks and nuns whom he had come to know through his work and was kindly provided with relevant information for his text. Dom Ambrose Griffiths, Abbot of the Benedictine Abbey of Ampleforth, in Yorkshire, was a long-time friend of Roseman and Davis from their sojourns at the monastery in February and March 1983. The distinguished Abbot was a student at Ampleforth's secondary school and won a scholarship to Balliol College, Oxford, where he obtained a First in Chemistry. As a monk of Ampleforth, he became Head of the Science Department at the School and later Procurator before being elected abbot in 1976. Roseman's work at Ampleforth includes a commissioned oil on canvas portrait of Abbot Ambrose for the monastery. The Abbot gives the artist a great compliment when he writes to him and says: "being painted by you has been a truly wonderful experience." "Ampleforth lies just on the southern edge of the North Yorkshire Moors and Rievaulx lies actually in a valley within them. The Moors extend to about twenty miles north of us and from about eight miles inland from us right out to the coast but they do not occupy the whole of the area between York and Durham so it would not be true to call the whole of the area the North Yorkshire Moors. The North Riding of York, which is now called the County of North Yorkshire, runs from York up to Teesside, which is still someway short of Durham. "St. Aelred of Rievaulx was the third Abbot of Rievaulx and was known by his contemporaries as the Bernard of the North because of his excellent writings and great influence." 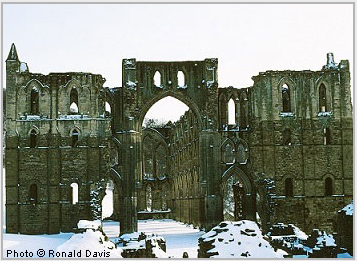 Rievaulx was founded in 1132 as a daughter house of the French Abbey of Clairvaux. Situated along the River Rye in a secluded valley, Rievaulx was exemplary of Cistercian architecture that developed in that transition period from Romanesque to early Gothic. The impressive architectural remains of the monastery testify to what the Cistercian monk and distinguished historian Louis Lekai refers to as the "sober simplicity'' and "incomparable elegance'' of the former, great Abbey of Rievaulx. In their journeys to monasteries, Roseman and Davis made gifts of the artist's drawings in appreciation of the gracious hospitality and encouragement they received for their work. Included in the artist's drawings from Ampleforth Abbey is the portrait Dom Gerard Sitwell - "a very fine drawing," writes Abbot Ambrose in his letter of appreciation for the gift to the monastery, (fig. 7). Dom Gerard, also a graduate of Ampleforth's School, read English and Theology at Oxford University. During seventeen years at Oxford, he was Master of St. Benet's Hall, founded by Ampleforth Abbey in 1897 for undergraduate and graduate students. Dom Gerard was related to the famous Sitwell literary family. The monk's own literary work as translator, editor, and author includes Medieval Spiritual Writers and St. Odo of Cluny by the tenth-century monk John of Salerno, as well as articles for the Encyclopaedia Britannica and the Dictionaire de Spiritualité. Roseman met Dom Gerard in his retirement years. The erudite monk was greatly encouraging to the artist for his work on monastic life and his studies on monastic history. "Father Gerard invited me to join him on his walks in the Yorkshire countryside," writes Roseman, "and his enlightening conversations were always a learning experience for me." "I am deeply appreciative to Father Gerard for the time he kindly gave me for my work." The artist's sentiment was reciprocated when Dom Gerard thoughtfully wrote in a letter to him: "My Dear Stanley. . . I was very pleased and felt honoured when you wanted to draw me. . . ."
"Thank you very much for your wonderful letter and your kind words. It is very good of you to give us your very fine drawing of Father Gerard. I realize how much the drawing means to you and that makes the gift all the greater. "The drawing of Father Gerard has now arrived safely and looks even finer in its mount. . . . Father Gerard is very pleased that we have it and it has arrived at a specially good time for him. He is to celebrate 50 years as a priest on August 9th with his relatives and friends in Norfolk. I shall have the picture framed in time for him to take with him so that all his relatives can see it as they will love to do. . . . Thank you very much. The drawing will give great pleasure. "I do hope we shall see you again . . . Thank you again for your great kindness and please remember me to Ronald. With all good wishes, Yours affectionately, Ambrose"
Roseman drew Dom Gerard in prayer in choir and the complementary portrait Dom Gerard Sitwell, presented here, that Roseman drew when the monk and the artist had returned to the monastery from a walk together. The portrait of Dom Gerard is exemplary of Roseman's painterly use of the chalk medium. Vigorous strokes of black and bistre chalks describe the wide-brimmed hat and the collar of the monk's black overcoat. The ochre paper imbues the composition with a warm tonality. 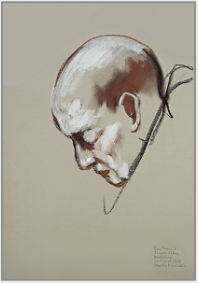 The artist renders the subject's facial features with the blending of black and bistre chalks and with passages of white chalk that capture a strong, northern, wintry light on the ascetic monk's face seen in three-quarter profile. This deeply felt portrait depicts the Benedictine monk in a moment of introspection. 1. Stanley Roseman - Dessins sur la Danse à l'Opéra de Paris, (Paris, Bibliothèque Nationale de France, 1996) p. 11. 3. Nashdom Abbey Record, (Buckinghamshire, Nashdom Abbey, 1984), p. 6. 4. Benedictine Yearbook 2012, (Warrington, English Benedictine Congregation, 2012), 78. 5. Louis J. Lekai, The Cistercians, (Ohio: Kent State University Press, 1977), pp. 267, 270. Further correspondence from the monasteries is quoted throughout the website. Abbot Ambrose refers here to St. Bernard of Clairvaux, with whom his younger contemporary is often compared. St. Aelred was a leading humanist in the Twelfth Century Renaissance and author of the treatise Spiritual Friendship. Presented here are further selections from the extensive correspondence over thirty years from Benedictine, Cistercian, Trappist, and Carthusian monks and nuns to Stanley Roseman and Ronald Davis.